Home » Creativity » Who’s that? Tens of thousands of photographs from the First World War feature people who have no name. Who are they? Where did they come from? What was there story? Did they fight and die or fight and survive? Help identify these people and tell their story and in many cases remember a person as more than just a name on a memorial – they had parents and siblings, they went to the local school and played cricket for the local club … bring them to life in the 100th anniversary years of the Great War, that war that H G Wells said ‘would end all war’. There are six photographs in this set which show the entire ‘cadet squadron’ and their commander. These embedded them in Hastings in 1918 and could offer more clues and of course more faces to ‘play’ with. I doubt any of this group saw service as the influenza epidemic and dreadful weather made completing training by November 1919 difficult … but the Royal Flying Corps barracks here had been used for a few years and indeed the younger brother of Jack Wilson had signed up age 17 and was flying bombers over Belgium at the time of this picture. 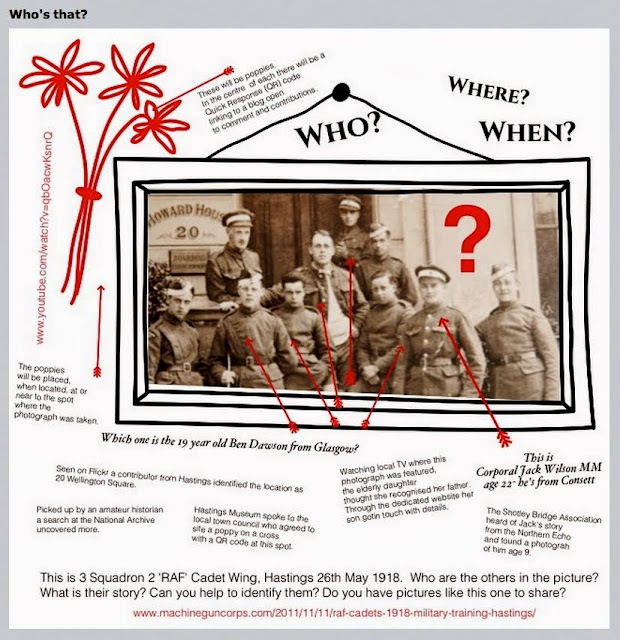 I think I need to indicate that multiple connections can be made a) geographically to the wide ranging UK locations these cadets came from and b) their links to combatants in the RAF or other services at this time including those who die c) for some, the schools they had just left – so Jack Wilson who left school at 14 and came from the Iron and Steel town of Consett finds himself in the mess-room with boys straight out of Harrow and a Cambridge undergraduate …d) those who remained in the RAF and go on to serve, potentially in a senior capacity by the time of the Second World War i.e. the picture becomes a way to explore people, places, history, society, education, class, military history e) the Charlie Chaplin films being shown … the coming of radio e) even bringing it as close as I can to the present day as Jack Wilson lived into his 97th year and went to an RFC/RAF reunion in 1992, attended the 75th commemoration of the Battle of Passchendaele and on watching the First Iraq War on TV remarked ‘That’s Nothing Compared to Passchendaele’ … and said, ‘If I was a younger man I’d like to go out and have a go’ … and warned me, his 30 year old grandson that I might get called up!! So, not realising it the multliple threads perhaps make this, and therefore any picture like it, full of possibility ESPECIALLY because of the connectedness of Web 2.0. Very many thanks. Interest in this very much helps me to stick with it and fix it rather than going off on a tangent. I need as I go through the necessary task of simplifying and magnifying the idea that works rather than thinking that adding more or coming up with new ideas will in any way help. I’ll work on what you suggest. The picture could fill the poster … ‘BE’ the poster with rollover and drop-down on faces. This offers the greatest opportunity, not least because already, since 2005 or so, when I first put these on Flickr, there have been contributions. Not least I recall being interviewed for research into memorialising the first world war based on a search stumbling upon this picture. Something I’d forgotten – that by tagging and ‘pushing’ an image on the Web it makes it ‘vulnerable’ to being picked up through serendipity and the more interest, clicks and comments, the brighter the light shone on it by the search engines … so it becomes self-fulfilling. Would it help or hinder to target this at secondary school GCSE students? This at least gives me some parameters and learning objectives to work from. By Jonathan Vernon in Creativity, E-Learning, H818: The Networked Practitioner, MA in Open & Distance Education, WW1 on December 18, 2013 .